Construction work has begun at MEYER WERFT in Papenburg on the second new ship for the British shipping company Saga Cruises. Today, the ship yard started its steel-cutting process for Spirit of Adventure. The second new build for Saga Cruises is to be delivered in summer 2020. 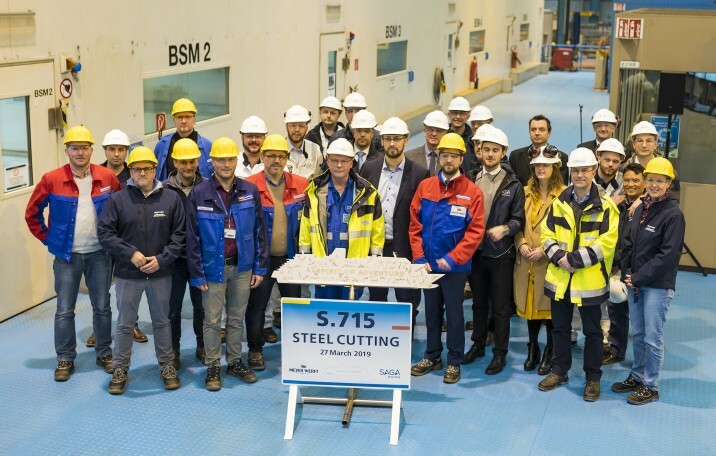 The teams of Saga Cruises and MEYER WERFT pressed the start button on the computer-operated cutting machine that will process the first sheets of steel for the new ship. This marked the start of the ship’s production. Like her sister ship Spirit of Discovery, Spirit of Adventure will be constructed in Building Dock I. It also means three cruise ships will now be delivered to various customers in 2019 and 2020 by MEYER WERFT. The Spirit of Adventure is the second ship for the successful British cruise line. The ships each have an overall length of 236 metres, a width of 31.2 metres and a tonnage measurement of 58,250 GT. 999 passengers can be accommodated. The new ships will be tailored to the British market with a completely new design to make them stand out in every port, and their interior design and technology will set new standards.